Lamb shanks are a frequently overlooked cut from the sheep - there's lots of cartilage and tendons and collagen in them. So they need a good long cook, either in the oven, or in a slow cooker/crockpot, or sous vide. In this recipe, I also show you how to make a simple but delicious red wine reduction sauce. Season the shanks with salt and pepper. Coarsely chop onion, celery and carrot and place them in your crockpot or a casserole dish. Pop the shanks on top of the veg and add enough water to cover them. Add a sprig of rosemary and a bay leaf. If using the oven, set the temperature to 160°C (320°F), cover the casserole, and cook for at least 4 hours. If using a slow-cooker, you'll want to give it about 10 hours. Set your sous vide gadget to 66°C (151°F). Season the shanks with salt and pepper. Pop them in a ziplock or vacpac bag, add a good glug of olive or rapeseed oil and a sprig of rosemary. Extract the air, seal the bag, and cook for 24 hours. Towards the end of the cooking time, strain off a cup or two of the cooking liquid, boil it rapidly to reduce by half, check for seasoning and add a pinch of salt if necessary. If your liquid is particularly fatty, you might want to put it in the freezer for half an hour and then remove the fat. Add a cup of red wine to the stock and bring to the boil. Turn the heat down to a simmer. Sift one or two teaspoons of flour into the liquid to thicken it a little. Just before serving, melt in a knob of butter. Serve with buttered new potatoes and vegetables of your choice. Meltingly tender lamb shanks. The video above is from the Keef Cooks YouTube channel. 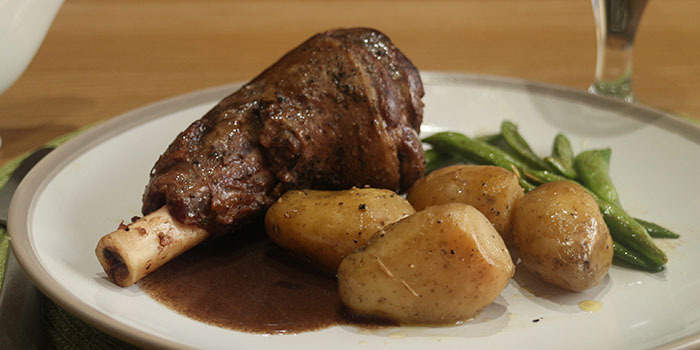 Click here to see the video recipe of Slow-Cooked Lamb Shanks With Red Wine Sauce on YouTube. Total time: 24 hours 10 minutes.